Collar – Buy an adjustable collar that will fit securely around his neck without choking him. Leash – Purchase a retractable leash so you can control the distance you give your Labrador when walking him. This leash is also good for training. Food and water bowls – Your Labrador puppy needs two dishes, one for food the other for water. Stainless steel or ceramic dishes are best, as plastic tends to breed bacteria. Dog bed or pillow and/or blanket – Your Labrador will need a place where he can relax and sleep. Either Purchase him an adult sized bed (24” x 36”) or pillow (45” to 55”). Blankets also add extra comfort. Crate – Properly crate training your Labrador puppy will provide him with a comfortable space he can call his own. Crate training makes traveling easier, and provides your dog with the supreme relaxation at times when he needs to feel safe. The best sized crate is between 36” – 42”. Food – Feed your Labrador puppy the same food he was being given by the breeder. This will help him adjust. You can switch his food later if you would like, but to start keep it simple and familiar. 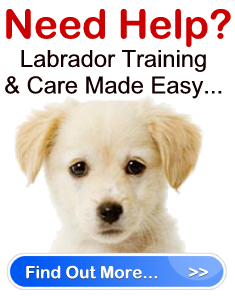 Treats – Have treats handy to please your new Labrador puppy, and to make beginner training easier. Toys – Labradors are natural born chewers and will eat through any entire wardrobe if given the opportunity. Provide your lab with plenty of chew toys, tennis balls, ropes, bones and durable plush toys to enjoy. Just make sure when you play with him you use these toys so he will know they are his and can enjoy them. Name – Your Labrador will need a name before you bring him home. Choose a name together with your family, and make sure it is something you all like. Call him only by his new name when he first arrives so he will become used to it. When should I bring my Labrador puppy home? During a vacation you took for the exclusive purpose of bringing the pup home. You will want to make sure you will have a few days to spend with the dog before getting back into your regular work routine. Your dog needs to adjust properly so he won’t feel separation anxiety. Is there any time I should not bring home my Labrador puppy? Yes. You should not bring a puppy home during busy holidays when you will have plenty of visitors and your house will be out of sorts. It is imperative you make your new puppy feel safe, and that you provide him with a taste of what your regular everyday home life is like so he can adapt. Get everyone involved in welcoming the new Lab home. Make sure they know how to handle the puppy. You should also introduce the other pets to the new puppy. Make sure when the pets interact that you are in the room so you can safe guard the new pup. Bringing your Labrador puppy home is an experience you can both enjoy. Make the most of it, by making him the star. You should have no other distractions.